If you have been looking for a site to get your teeth into recently, then look no further. Boku Slots have found the perfect place, which provides a great mix of games and offers called Chomp Casino. If you’re a regular gamer then you’ll probably be aware of the brand behind Chomp Casino, which is the ever expanding Nektan. Wide choice of payment options including Boku billing. Chomp Casino has a great three tier welcome package for its new players to take advantage of. This deal is the perfect way to try out new games, which you may not have considered previously. 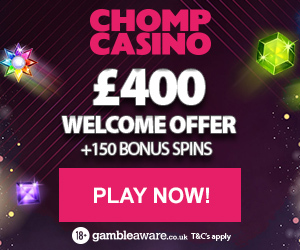 1st deposit 100% cash match plus bonus spins – When you place your first deposit with Chomp Casino you will be allocated with a 100% cash match bonus up to £100. On top of that you will receive 50 bonus spins on the frenzied Starburst slot game. 2nd deposit 100% cash match plus bonus spins – Upon your second deposit you will again be allocated with 100% cash match up to £100 and given another 50 spins on Starburst. 3rd deposit 50% cash match plus bonus spins – Then finally on your third deposit, you will receive a 50% cash match up to £200 and another 50 spins on Starburst slots. There is a minimum requirement when depositing in order to be eligible for the promotion and you will be happy to hear it is a very low £10. If you were to deposit £10 on each occasion you would have £30 in real funds. Then you will be awarded £25 in bonus cash, giving you a total of £55 to play with and 150 spins on Starburst. Getting access to your account wherever you may be, is easy with Chomp Casino. All you need is a mobile or tablet device, such as an Android, iPhone or iPad and you can enjoy incredible gaming whenever you choose. If you want a mixture of games, then you are going to be very happy when you check out Chomp Casino. The slot games that can be found here are nothing short of brilliant, especially the Emoji game. Connect 5 or more emojis and they will be removed as winnings and then more emoji’s will be dropped in their place, meaning further potential wins. This is a fun game and definitely one to be played when you get the chance. There are also featured favourites such as Cleopatra and Epic Gems, so you know you can always replay your old faithful. There is a wide range of casino games to choose from, with a mixture of live dealer and the usual video style games. Unlike many other sites Chomp Casino offer demo options on their non-live games, to give you the opportunity to try before you buy; so to speak. If you’re looking for something to fill a small gap in your day, then we always recommend the instant games. On Chomp Casino you have the best games around such as Foxin Wins Scratch and the interesting Merlin’s Millions. Happy Hour Tuesday – Deposit a minimum of £20 between 6pm and 10pm on a Tuesday, to receive 20 bonus spins on the amazing Cleopatra slot game. 100% cash match on deposits of £51 – £150. Bonus Spins Thursday – How do bonus spins sound? Well if you deposit an amount between £10 and £19.99 you will be rewarded with 15 bonus spins. But if you deposit £20 or more you will receive 40 bonus spins. The spins are to be used on the Dead or Alive slot game and can only be awarded when depositing these amounts on a Thursday. Chomp Casino has a tailored VIP scheme to offer its members. When you have become a member of the scheme you will be offered access to VIP promotions, increased deposit limits, monthly bonuses and even birthday bonuses as well. This is a great way for you to connect with the Chomp Casino team and other players if you wish. Follow them on Facebook or even Google+, to be kept up to date with new offers, promotions and game releases. There are three ways to get in touch with a Chomp Casino representative and they are email, telephone and live chat. The site isn’t manned 24/7 so if the live chat is down, you may need to call or email instead. Chomp Casino accept the following payment methods which include, credit or debit cards, Paysafe Card, Neteller, Skrill and Boku Mobile Billing. We have a list of games as long as our arms that we want to go and try on this fantastic site. If you’re ready to claim that impressive welcome package, then simply head over to Chomp Casino and make your first deposit.